When you use a third party app to schedule your posts on facebook, something is missing. There is NO share button! You want people to be able to share your posts with their friends. You WANT your posts to go viral, but that can't happen if they can't share them. 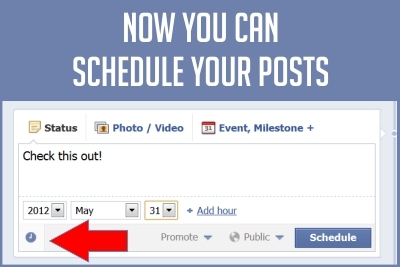 Now... you can schedule your posts right in facebook. Easy Peasy! Posts can be scheduled ahead of time OR put into your timeline past. When you add the year, the month option will pop up. When you add the month, the day option will pop up... and so on. When you hit schedule, your posts will be visible in your activity log, where you can edit them or delete them. Here's a graphic breakdown of what you'll see. When you start, you will only see the Add Year option, then the rest will pop up as you make your choices. If this found this post helpful... feel free to share it with your friends! How To Schedule Your Facebook Posts Right On Facebook And WHY You Should Do it! Very cool to know about! Thank you!!!! !